My days seem very long now, as my hubby is gone again, leaving me with the evenings to create. 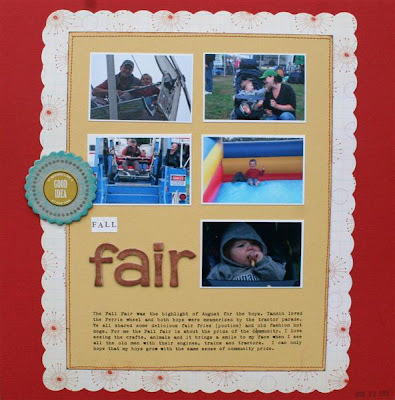 This is just a simple layout, catching some of my favorite moments from the fall fair. I am really hoping to get to some of the more "Springy " Layouts on the go tonight. I got a bunch of new papers with some bright and wonderful colors that I am finding very inspiring. Products used are Scenic Route Pattern Paper and chipboard letters, Bazzill Cardstock, MM tiny alphas, Basic Grey chipboard, Gel e tins Stamps and 7 gypsies stickers. great layout...love the color contrast between the red and the PP. Love the design on this one! I always love to make spring/summer layouts as well.